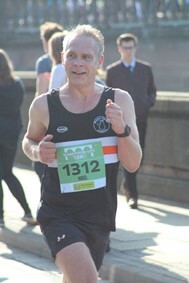 A staggering 148 runners took part in this year’s 10K city race around Worcester, although looking at the list I think a few are missing or registered a bit late. The home crowd and supporters were monumental, it being our home town and all. The dedication of some BPJ’s is second to none. No less than 3 people had birthdays yesterday and all ran. Sven Rouse, Matt Fitzgerald (38.46) and Sam McClory. Sam gainfully enjoyed a rendition of happy birthday by adoring fans and supporters as she majestically brought up the rear and accompanied the tail motorbikes home. Charm Whitehouse managed to squeeze in to the start of the race by the skin of her teeth as she slid off her bike and into position at 9.26am having enjoyed a raucous hen do in Leamington Spa the night before. 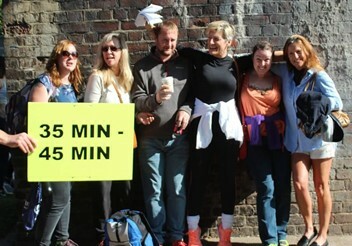 Dan Cale, however, renowned for his lateness, was remarkably on time despite coming from Droitwich and even made the group photo by Cafe Severn. The Greeno‘s were out in force with their unofficial Percy Pig BPJ flag. Whilst Jason was running, Eleri was handing out medals with Gay Grove at the finish line. 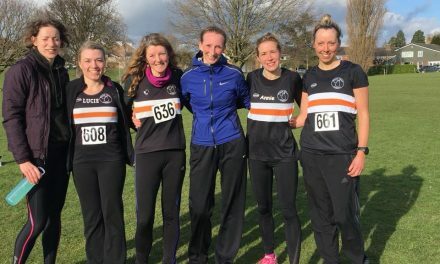 It was also lovely to see Bethan Stimson back in the fold after the recent birth of her baby daughter with Jon Shacklock, who was participating in the runbikerun event. So what has the club done for some of you? Well clocking up a whopping 48 PBs, I would say a great deal. 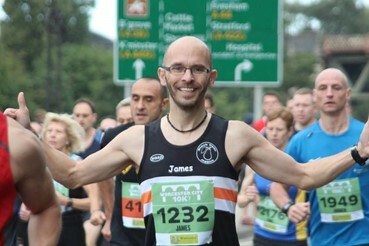 Of course the hard work, training, effort sessions, sprints, hill works, long runs etc are all down to you lot, but I know for a fact that without the undying support structure, laughter, fun and enjoyment that I enjoy with all my BPJ friends and family, I would not love my running or this club as much as I do. Seeing one of my best friends struggle a little bit towards the end of the 10km with her asthma, I ran the final few hundred yards to ensure she got over the finishing line. I wanted to make sure that she secured her medal and her t-shirt, but more importantly that she made it to the first aid tent. She is fine and was actually more worried about securing her goodie bag once her breathing had returned to normal. 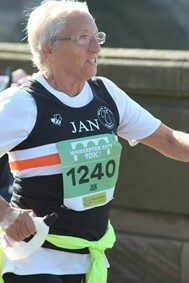 The wonderful thing is, Hazel Sherrington managed a PB and I so cannot take ANY credit for that hard work, determination and training. A bit like the Brownlee brothers, it is looking after each other like this that makes events like these within a club like ours so much more rewarding. 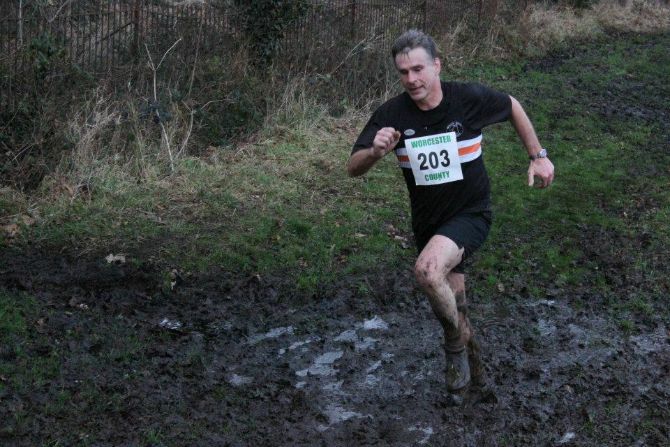 It was lovely to see how many BPJ couples took part as our love of running tumbles over into our private lives. 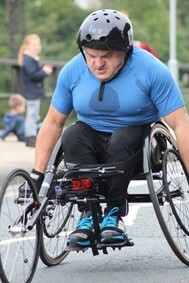 First across the finishing line for the BPJs was Ian Wild, in a gravity defying 35.51 and 16th position overall. 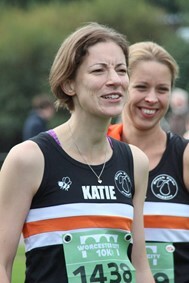 His partner Lucie stormed home in 46.16. It was also fabulous to see Emily Seward back to her winning form as she flew home in first BPJ lady place in 42.34. 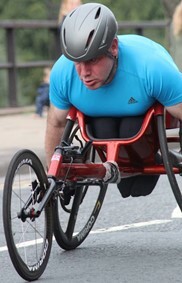 Second man home was Nick Drabble in 36.06 and he and his wife Dawn won the mixed doubles at joust earlier this month. Neil Laurenson clocked a cracking 37.03 coming in third BPJ and flying our club colours and his wife Rachel ran a very respectable 1.00.26. 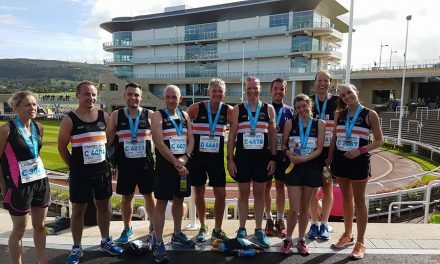 Matt Davis flew home in 37.22 and Sarah Morris, his partner, who was participating in her first duathlon in the Runbikerun was chuffed with her performance of 2.35.31. The Griffiths, Simon and Lorraine, make a formidable team and both produced superb times as always. Simon in 38.57 and Lorraine in 45.24. 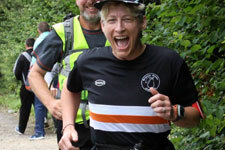 Sarah Kellett, second BPJ lady, pipped her fella, Rob Owens, to the post with her 43.03, but he knocked a whopping 4 minutes off his time from last year and snaffled himself a pb. Nick Eacock knocked 4 minutes off his time to land himself a 41.07 PB and Kate bagsied herself a time of 52.17. Suzie Chamberlain French and her husband Nick French, Avril and Stuart Munday, Mark Peverelli and Rebecca Spencer, Mark and Sue Dillon, Chris and Gail Berry, Rob and Louise Gilbert (who knocked 8 minutes off her PB), the list of couples and PBs this year are just too many to mention, so sorry if you didn’t make the cut this time. I have listed the PB names that I know at the end. One mix up was resolved and Derek Jackson was restored to his rightful place at the top of the MV60 podium once more. A smashing 38.58 saw him win the veteran prize. 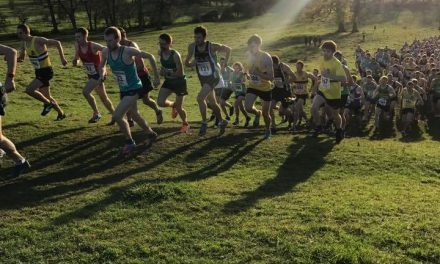 If you can’t run and want to pass your number on to somebody else please contact the race organisers and engineer a name change and the relevant age category adjustment as this is the only way to avoid depriving somebody of their rightful hard earned win. Officially you can be expelled from EA for this, so do please think about the consequences. Last but by no means least in the 10km was Jess Hathaway who secured 3rd BPJ lady and smashed a PB she set 9 years ago which now stands at 43.20. She knocked 50 seconds off. We had 4 p articipants (and one ex BPJ) in the Runbikerun duathlon event. (My disclaimer here is I was unable to filter results by clu b as the club was not listed in many instances so I posted on FB and can only go with who responded. Needless to say Donna was first to reply… ha ha!) 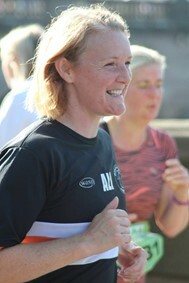 Donna Rushton was 8th female and ran the second 5km leg with Keith Whitehead, team GB triathlete. 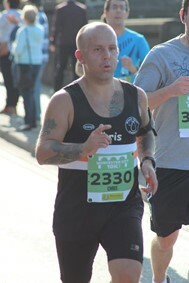 This was a 40K challenge (10k run with everyone else, 25k bike ride and 5k run. 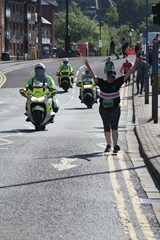 Donna secured a finish time of 2.16.